Or rather, the police will decide for us. Police have closed down the “Occupy Sydney” camp at the top of Martin Place. Of course it was done by means of a dawn raid. They say that they had attempted to negotiate with the protesters – they would let them protest in daylight hours but not occupy the site overnight. Doubtless they were hanging their hat on the various “no camping” provisions in the Local Government Act, but to me that misses the whole point of permissible levels of protest and at what point protest must or should be stopped. I walked past the “OS” gang a few times on my way to the dentist and on other errands around town. They seemed a pretty benign and peaceful bunch: the most menacing characters present were the police. 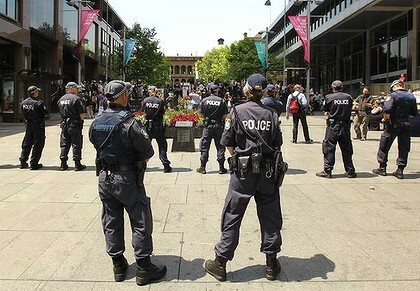 “It was time that we took steps to return Martin Place to the community of Sydney,” Mr Murdoch (the relevant police officer) said. This entry was posted on October 23, 2011 at 12:47 pm and is filed under Australia. You can follow any responses to this entry through the RSS 2.0 feed. You can leave a response, or trackback from your own site. Don’t Sydney City Council have any high pressure water cannons? I would blast these scum into the next world! Well I think it’s a good thing you don’t have a high-pressure water cannon. Where’s this “scum” thing coming from, anyway? The ‘thing’ that always amazes me is these ‘protestors’ about the big end of town, drive cars, use mobile phones, wear expensive clothing and collect the dole! Mr Glanville meant the police, silly.